If water coming out of the shower is completely cold then it is likely a faulty TCO (Thermal Cut Out). 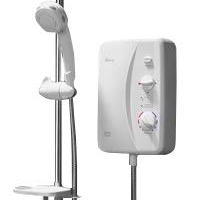 The TCO is designed to cut off power to the elements if the shower overheats. Using a multimeter it is possible to test the TCO. A faulty TCO will have no continuity across the two terminals (the black part on top of the heating tank). A good TCO will have power at both connections and a faulty TCO will have power at only one. If the water is even slightly warm it may be a faulty element in the heating tank. You can test the elements using a multimeter- you should get a reading of between 12 and 18 Ohms.